with workshops previewing ball dances during the day, and a different themed live-music historical ball every evening. 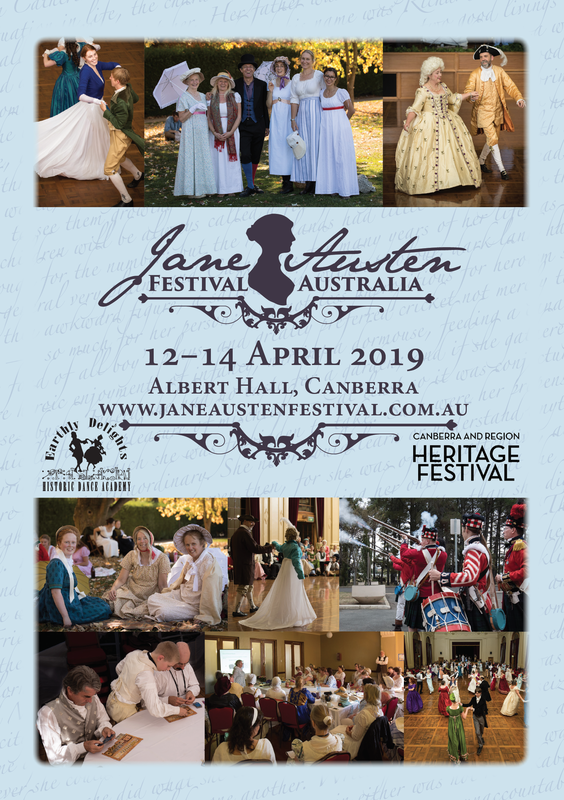 This year’s Jane Austen Festival Australia (JAFA 2019) is the 12th in this remarkable annual celebration of everything Georgian, Regency and Victorian. The three full days and nights of costume, music, dance, food and friendship at Canberra’s beautiful historic Albert Hall will leave you feeling this is how life should be! The daytime activities to choose from—all with top presenters from around the country—will include classes on sewing and singing, workshops on costume making and hair styling, talks on history and novels, impro-theater rehearsals, outdoor games, and previews of all the dances planned for the evening balls. On the final day there’ll also be a promenade and picnic. See the full festival program here. Each evening everyone will come together for a ball on a different historical theme and with different special performances. There will be Earthly Delights Historic Dance Academy dance leaders, great musicians on grand piano, cello, clarinet, flute, pipes, hurdy-gurdy, mandolin and guitar), the superb choir I progetti and theatre presented both by ACT Impro and by a Kirsty Budding troupe (performing a scene from Pride and Prejudice). These local artists will be joined by wonderful interstate dance leaders David Wanless and Vaughan Wilson and fantastic interstate musicians Deanna Devers (harp and piano), Hannah Buckley (violin) and Aimee Brown (recorder). To top off the day and evening treats there are complimentary buffet lunches, morning and afternoon teas and suppers throughout the festival! By the end of the weekend you’ll understand why Jane Austen wrote in Pride and Prejudice that ‘To be fond of dancing was a certain step towards falling in love’ and ‘There is nothing like dancing after all. —I consider it as one of the first refinements of polished societies’, why she had Mr Tilney declare in Northanger Abbey that ‘I consider a country-dance as an emblem of marriage’ and why it is remarked in Emma ‘when the felicities of rapid motion have once been, though slightly, felt—it must be a very heavy set that does not ask for more’. See below for ball themes, further below for link to ticket site, and bottom of this page for event poster. Titles with an * will be uncalled for those who attend the late-afternoon experienced-dancers-only session. Titles in italics will be a special display. All the other dances will be called for all and previewed in the early and late morning workshops and up for revising further by novices in the early afternoon sessions. In between readings from one of the first and funniest books Jane Austen wrote, her ‘History of England’, enjoy participatory dance from the time of the Kings and Queens she mentions, though to the Georgian era that offered the styles of Jane’s adolescence. Enjoy also the fabulous choral ensemble I progetti and a candle-lit supper. Dress Georgian, Regency or semi-formal. See further below for tickets. In the first half of the evening, in between readings by Katarina Hall of Austen’s very fun ‘History of England’ we will sample dances from the periods of the reigns referred to. Spagnoletta—where the women get to lift the men! *Lansdowne no. 4— an incredibly fancy pattern to a great tune. *Masque of the Season—bringing a rare manuscript’s dance and music to life. *The Conundrum—an amazing 2-couple bourrée to Bach’s cello suite 4. Irish Washer Woman—a simple longways dance to match this lively tune. CountryBumpkin—get a hat on your set’s bumpkin and get ready to reel! Meditation Chinoise—a double-sized set that will have you doubled over laughing! Between opening grand march and closing fun novelties, enjoy mixers, squares and longways country dances from Jane’s lifetime, with matching music from period English, French, Scottish and newly discovered Australian sources. Special features will be two big dances—one miming the game of Chess and one set to Beethoven’s Ode to Joy. Enjoy also our guest theatre ensemble presenting a scene from Pride and Prejudice, fabulous guest harpist, guest singer, and candle-lit supper. Dress Regency or semi-formal. De’il among Tailors—a simple way to enjoy this fabulous Scottish tune. National Waltz—one man between 2 women in this progressive pleasure. Hull’s Victory—ready to stomp with a dance and tune that go back to the 1812 war in North America. SUPPER and Kirsty Budding Theatre presents a scene from their upcoming ‘Pride and Prejudice’. -(pawns)/*(nobles) The Chess Dance—for sets of 32! We have life-size boards for two sets! Réverbère—an example of the ingenious square dances being created for social pleasure. Mazurian Anglaise—a crossing of the Polish mazurka with the English country dance. *Mazurian Ecossaise—another hybrid of two of the most popular dance forms of the day. 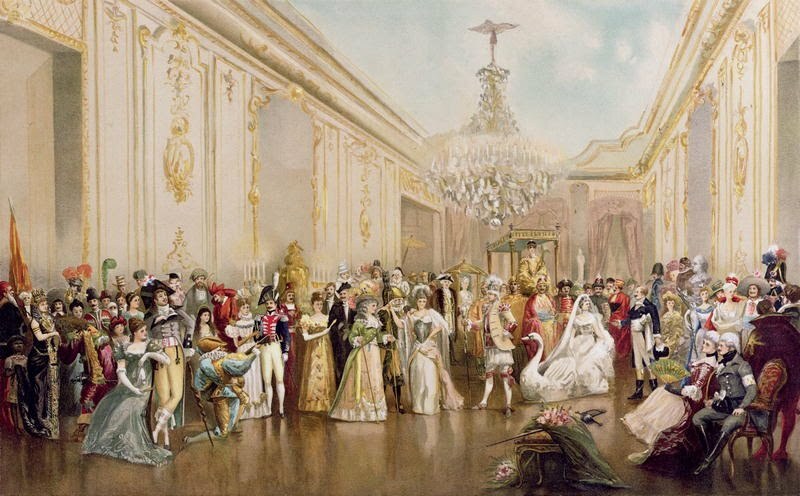 Congo minuet—the wild early 19th century way to enjoy the most-esteemed dance of the 18th century. Dress how you like from Tudor to Victorian (Regency still welcome,). The Festival choir will entertain all as we gather for the costume parade. The post-Jane dances for all will include an 1820s gallopade to the ‘William Tell’ overture, a beautiful quadrille from 1830s Denmark, a can-can quadrille from 1840s France, the ‘Rose Bay Quadrille’ from 1850s Australia, a 'Gothic dance' from 1860s America, and an English 'village' dance with scarfs. There’ll also be supper, reels, games, couples and country dances and final farewells. Grand costume parade into Rose Bay Quadrille, set to music in the first dance book printed in Australia. A Swedish dance—a fun way for ranks of 1-man-between-2-women to meet different opposites. Lowe’s Galopade—to the thrilling 1829 'William Tell' overture. Triolet Waltzer—men dance with every woman in the room in this fun 1-to-2 mixer. Les Sylphides—a famous elegant Danish quadrille to this beautiful ballet music. Fancy Quadrille figure, The Basket—set to the uplifting ‘Life let us cherish’, with guest singer Adela. The Gothic Dance—bring out our Northanger Abbey theme with this fun arching galop. *Five steps to Heaven—some snazzy variants in another mid-century couple dance craze. Le Polo—a late 19th century French quadrille that became a world-wide hit. Greensleeves—a manifestation of the English nostalgia for the village green. Ribbons supplied! Ostendaise—a simple way to couples dance, and we’ll share the fun by progressing partners. The Orpheus Quadrille—revisit the standard quadrille done left-bank Paris Can-can style! *La Parisienne—make a medley of popular waltz, polka, schottish and polka-mazurka. Asher Minuet—relax with this elegant late 19th century response to ‘new-fangled rubbish’. The Boston Ball—a cross between waltzing and indoor soccer! For more information on the festival as a whole (all the no-dance activities) go to http://janeaustenfestival.com. The collage makes for a wonderful world of fun!